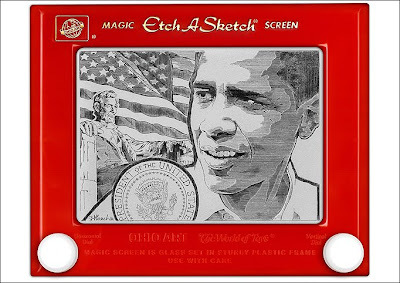 It took an Ohio etch-a-sketch "artist" 30 hours to complete this impressive portrait of the 44th President. What do you think? Should he have added anything or one? I just missed the whole etch-a-sketch phenomenon, but I recall my cousins had one in their closet. Right next to the Battleship and Game of Life. The old lounge lizard line was, "Come up to my place and I'll show you my etchings..."
Who could've known it meant etch-a-sketchings? I don't know, I think that putting hours of hard work into something that will disappear at the first hint of an earthquake...or worse, if you bump into something while you're moving it, tilt it up or to the right or anything, is kind of a waste of time. The "artist" is probably living off welfare. Having been raised on Etch-a-sketch and only mastering making squares I AM impressed with the whole shading thing. THAT'S talent! The "artist" is probably living off welfare. and how come you're posting in the middle of the day when most ppl are working. Keep this kind of exchange with your fellow commenters out of this blog. Disagree, yes. But never disrespect. @Knox: LOL! Oprah should definitely be there somehwere. Incidentally, I really think that is a good likeness of the Prez. That takes "skill", well of a sorts. For my favorite Sarahphile. New today. Sometimes the etch-a-sketch can be cheated by using a magnet-pen. Yes, it's nasty when a total stranger makes an assumption about you. Looks like a fake photo to me. Since there is no way to "pick up the pen" with an etch a sketch. Notice how the letters on the Great Seal of the USA are completely seperate from each other and everything else. Aren't You Happy You Live In SoFla?